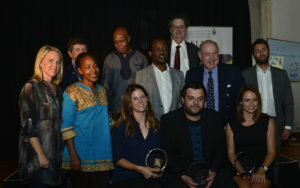 Stories by journalists from News24 and amaBhungane were honoured with the top prize at the 14th annual Taco Kuiper Award for Investigative Journalism on Friday 29 March at the Wits Club in Braamfontein, Johannesburg. 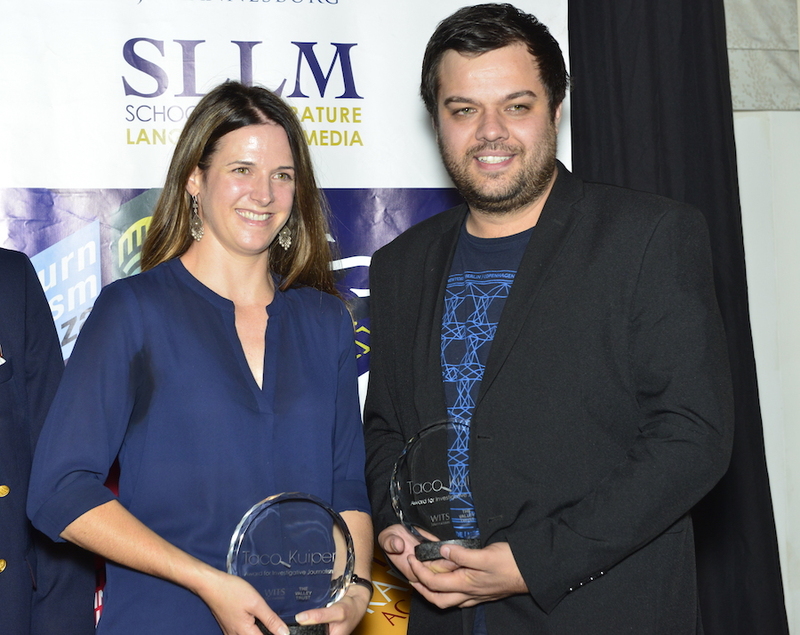 The shared award went to amaBhungane’s Susan Comarie for her Regiment Capital series, and News24’s Kyle Cowan’s work on Bosasagate. The two winners received prizes of R120 000 each. Caxton Professor of Journalism at the University of the Witwatersrand and convenor of judges said knocking down the finalists to the top three was the hardest part of the judging process. “As always, we had to ask ourselves what we most value: Is it stories that have the most impact, or different ones that open up different parts of our society? Is it the racy story, or the one that shows dogged digging? Is it important to break the story first, or do it best?” he said. Comrie said that being recognised for work done on her own was a big deal as she had previously won with 18 other journalists from her team. Co-winner, Cowan’s investigation into Bosasa has also resulted in the company’s current and former executives being interrogated at the State Capture Inquiry. Comrie plans to put the R120 000 prize into her savings account to buy a boat to sail around the world for two years with her boyfriend. Cowan on the other hand, is set on paying all his debts so that he can be a ‘free man’. The runner-up prize was awarded to Pauli van Wyk from the Daily Maverick for her entry which consisted of seven pieces she did over a year detailing the devastating effect of Tom Moyane’s reign at the South African Revenue Services. She received a prize of R60 000. The judges were disappointed at the number of entries for this year. There were a total of 18 entries, a lot fewer than in recent times. “We attribute this to the general state of the industry, the particular troubles of some of our most regular entrants, and the inevitable focus on the big national story. We are sadly seeing fewer of the unexpected, different, left-field entrants that we so enjoy highlighting and encouraging,” Harber said. Zanele Mji from amaBhungane was given a special mention for “work that stood out for its quality” by the judges for her two pieces on land: Those graves were title deeds and Cradle of Conflict. 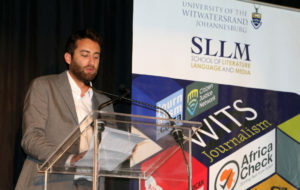 Pulitzer Prize-winning journalist and software engineer, Matthew Caruana Galizia, delivered the keynote address before the awards were handed out. Galizia is the son of the late Daphne Caruana Galizia, an investigative journalist killed by a car bomb near her home in Malta in October 2017. “When you’re fighting alone against mind-bending corruption, that’s when you’re at your weakest – and power doesn’t respect weakness,” he said. Despite the many challenges that Caruana Galiza’s mother faced, he made it evident that the governmen’ts efforts to bury corruption were fought back with as much effort and might, inspiring the room filled with journalists to endure the hardships of investigative journalism. The Pulitzer Prize winning journalist told guests that just by being an investigative journalist at a time when women were expected to be their husband’s servants, his mother shattered a thousand ceilings, and that she inspired generations of women and men. “We cannot remain silent when the machinery of the state turns on a handful of people whose only mistake is to stand up for justice in a country that is corrupting the world. We cannot remain silent when the tools of the justice system are instead used to bury the innocent alive and let their tormentors escape justice. We cannot remain silent while everything from which we derive meaning and a sense of purpose is auctioned off to faceless cronies who value nothing,” he said. This was the fourteenth installation of the annual awards in honour of the late journalist Taco Kuiper.